Trustees met at the Kenora Board Office on Tuesday, October 9, 2018, for a regular board meeting. Trustees also toured King George VI Public School prior to the meeting. The October Kids Come First presentation titled ‘How King George VI Public School Creates a Learning Environment that Promotes Student Achievement’ was received by Trustees. Principals Tim Flynn and Nicole Vingerhoeds were joined by some of their students to share their experiences at King George with the Board of Trustees. While King George is well known in the Kenora area for its Recreation Program and Special Education services, students shared some of the many other opportunities available to them at their school. From Hockey Canada Skills Academy, Primary Choir, and You’re the Chef programs, to language programming and Robotics and Lego Club, Trustees heard how the staff at King George go above and beyond to provide as many opportunities to students as possible. By providing a variety of programs and extracurricular activities for students in addition to academics, staff at the school note their students are happy, engaged and ready to learn. Shannon Bailey, Principal of Evergreen Public School in Kenora, and KPDSB Efficacy Working Group Member, presented the KPDSB Efficacy Report. In 2013, the KPDSB underwent a System Efficacy Review, conducted by internationally recognized efficacy experts with Pearson Learning Services. Since that time, the KPDSB has engaged in a "whole-system" effort of reform and change with all decisions centered around putting students first. In 2015, to support the work of efficacy in the KPDSB, and the implementation of actions and decisions, a System Efficacy Working Group, comprised of staff from schools and departments across the KPDSB, was implemented to advise the Board on decisions that impact classrooms and students and suggest areas of improvement. The work of efficacy has provided effective ways of identifying the needs of students and staff, as well as determining new and exciting strategies for improving attendance, graduation rates and mental health supports by using staff and student voice as the catalyst for change. For more information, please see the attached infographics. Deanna Pacheco, Student Achievement Administrator, and Caryl Hron, Superintendent of Education, presented the Elementary Achievement Report. In February 2017, the KPDSB introduced a new support model to assist identified schools, called focus schools, in the Board. In order to support the focus schools, which were selected based on student needs, the System Achievement Administrator was put in place to work one on one with administrators in each school (six in total) with the goal of increasing student achievement. The supports for each focus school varied, based on student and staff needs, but all included the use of different assessments to drive the work, as well as increased regular school visits by central support staff and networking between staff to share best practices. Recently released EQAO results for the 2016-2017 school year show historic results for some of the focus schools, including Sioux Mountain Public School and Red Lake-Madsen Public School. Staff feedback also indicates the new support model is working and following these successes, the number of focus schools for the 2018-2019 school year has been expanded. 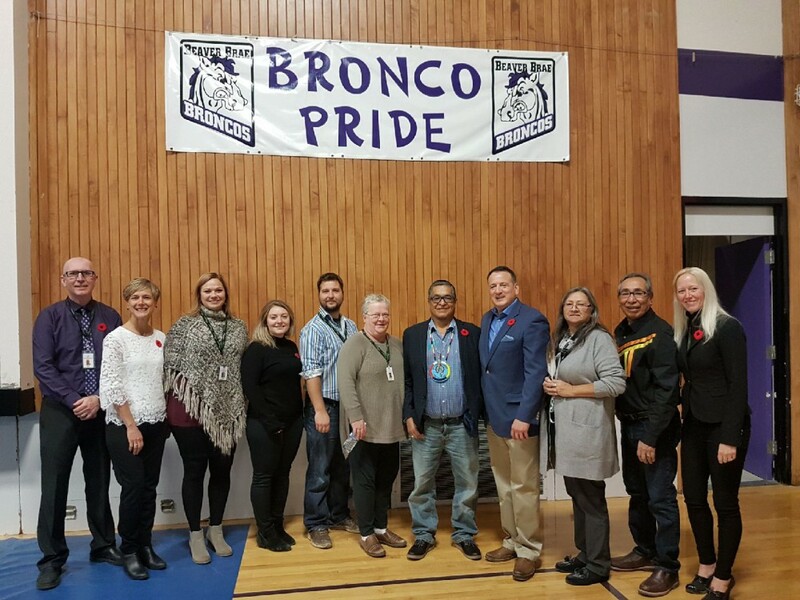 Staff and students of Beaver Brae Secondary School were honoured to welcome Ogichidaa Francis Kavanaugh, Grand Chief of Treaty No. 3, and Greg Rickford, Federal Minister of Indigenous Affairs, to the school today for a special assembly and Living Library in recognition of Treaty Recognition Week (November 4-10). The goal of Treaty Recognition Week is to promote public education and awareness of treaties and treaty relationships to facilitate greater understanding of treaty history and current issues. Following an opening prayer by Elder Bert Landon, Grand Chief Francis Kavanaugh, and Minister Rickford spoke, encouraging students and staff to learn more about treaties and their history, while stressing the importance of Treaty Recognition Week and corresponding events and activities, particularly involving children and youth. Students, staff and guests were then part of a Living Library session by Elder Robert Greene. Greene shared a history of local treaties, and the historical and current impact of those treaties. Grand Chief Kavanaugh stated "Treaties with Indigenous people are the foundation of Canada; honouring and upholding these sacred and everlasting commitments should be the upmost importance to all Canadians. I am pleased to participate in the initiatives held during the third annual Treaties Recognition Week, which I hope will foster greater awareness and serve as a reminder of our relationship to our treaty partners."